For those without comedic tastes, the so-called experts at Wikipedia have an article about Smeg. Smeg is nothing to be ashamed of. Its benefits are numerous in amount. Its very presence is widely believed to have been a decisive factor in almost every notable historical event. The addictive qualities of Smeg have yet to be scientifically proven. Millions of years of Dinosaur Smeg accumulation forms a thick marshmallow-y layer over the earth. Larger land-dwelling Dinosaurs experience limited mobility, allowing for the gradual rise of Smeg Dwelling Creatures. Mountainous regions experience smeg-slides causing large scale erosion, resulting in natural phenomena such as the Grand Canyon and France. Cave paintings discovered in modern day Portland indicate the use of smeg by the Cro-Magnon as a form of primitive currency. Eminent anthropologist Sgt. Manfred E. Gainsborough has posited that one unit of smeg, a heap, could be exchanged for two birds, a loincloth, or a "really sweet looking stick". Furthermore, it is believed that the use of smeg as a means of lubrication enabled the Cro-Magnon to rub two sticks together at faster rate, essentially resulting in the prodution of fire. Smeg is also believed to have been used along these lines as a primitive axle grease, allowing for further development with the wheel. Early philosophers spent long stretches of time pondering smeg and its "meaning". Logicians saw it as problematic, in that its presence could neither be affirmed or denied by means of deductive reasoning. The transitive properties of smeg were embraced by a group of Sumerian Mystics, resulting in the foundation of the School of Smegnosticism. Smegnostics believed that the true nature of smeg was unknowable and therefore irrelevant. This represented the first in a series of blows against smeg throughout history. Most notable in this era is the single most detrimental occurrence against smeg, namely the emergence of the Jewish religion. In regions of dense Jew populations, smeg levels dropped to record lows, and to this day, have never risen to pre-Moses levels. In Western Europe, smeg is back on the rise, with reports of sightings in Saxony, Burgundy and Dortugal. Interestingly enough, the kingdom of Smegaria reports no such increase. The rise is attributed to the regional dominance of Christianity and its emphasis on chastity and prudissitude.It is believed that smeg was eaten by William The conqueror before he successfully Shagged King Harold. Monastaries gain a significant foothold in the merchant economy, after amassing large holdings of smeg. King Henry the XVIth, in an attempt to regain the monarchy's influence over religious matters, issues the now famous Edict of Expulsion declaring smeg to be unclean and requiring all men and women to cleanse themselves of all smeg under penalty of stoning. This law is still enforced to this day in many parts of Great Britain. The Catholic Church counters with the canonization of St. Spugius, one of the most public supporters of smeg's role in church services. Leonardo da Vinci's Vitruvian Man. Check out the smeg. As an act of defiance, Martin Luther nails his 95 Theses to the door of Castle Church. The 74th through 87th theses refer specifically to the clergy's induglence and exploitation of smeg, as well as its inherent divinity. William Shakespeare composes several sonnets which realize the potential of smeg as a literary device. Sonnet 35 for example contains the lines "Then can I grieve at grievances foregone, Sometime too hot the smeg of heaven shines." 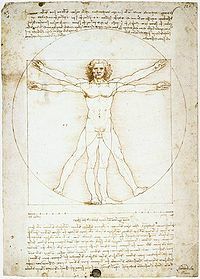 Also, if you look closely at Leonardo Da Vinci's Vitruvian Man, you can totally see smeg. Seeing unprecedented demand as a result of the collapse of the Oriental Smeg Road, a trade route, industrialized Europe turns to mass production to increase supplies of smeg products. This is widely thought to be beginning of the drastic decline in smeg quality. Unskilled factory workers begin to produce smeg through artificial means, while corrupt capitalists keep the highest quality product for themselves. As a result, smeg falls out of fashion, and is relegated to a purely functional role, as an engine coolant, food additive, and sanitizing agent. Karl Marx declares smeg to be the opiate of the masses. After misinterpreting the lyrics to a Bob Dylan song, a consortium of elite hippies begin to seek out large quantities of smeg for recreational purposes. Smeg rapidly becomes the drug of choice for many disenfranchised youths who mix it with chlorine tablets and ingest it through the proboscis, an act called 'cheesing it' in drug cultures. In an effort to curb the rampant use of smeg among the populace, the Drug Enforcement Agency takes drastic measures. They turn to the Secret Jewish Conspiracy group, the most powerful enemy smeg has ever known. Together, the two groups develop Compound F, now known as soap, and introduce it into market, effectively decimating instances of smeg nationwide. Similar measures are adopted in most countries around the world, except of course France. Hippies resist the use of Compound F, and continue smeg use to this day. Not to be confused with Smegmology, the study of smeg, smegnology is the fusion of technology and smeg, producing such marvels as the Smegmatronic Computer. Smegnology uses the biological origins of the smeg as a rich source of DNA. Since each single double helix contains as much information as is needed to create a complete human body, it is obviously a remarkable means to store information for other purposes. To this end smeg cells have been gradually edging into the lucrative computer memory market in the form of SIMMs (Smeg Induced Memory Modules), and the recently introduced 'Smeg Stick" which aims to replace the USB memory stick.